The Rajasthan government has put on hold all trials of genetically modified (GM) crops in the state. “The issue (of permitting trials of transgenic crops) indeed being fraught with concerns as no unanimity has arrived at, either in their favour or against them. The government, after considering different aspects of it, has taken a view to wait until a national consensus is evolved. It has also been decided that discussions should be held with all stakeholders and to form a view in this regard keeping in mind the guidelines issued by GEAC and GoI,” the order said. 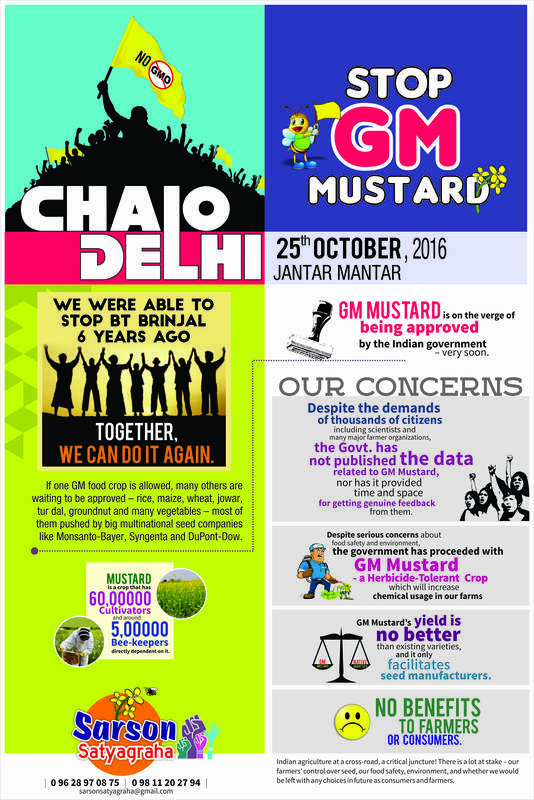 Significantly, the order comes close on heels of the government’s withdrawal of the controversial no-objection certificate (NoC) recently issued by it to the Delhi University for conduct of GM mustard trials in three locations in Rajasthan. 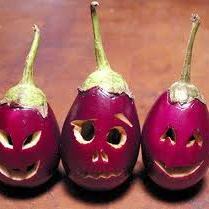 The trials had started in Bharatpur, Alwar and Sriganganagar and were nearing harvest. Responding to media reports and questions raised in the assembly, the government had ordered that the NoC be withdrawn. “On March 9th, the NoC was withdrawn and the crop ordered to be destroyed,” confirmed Anil Gupta, deputy secretary, department of agriculture. 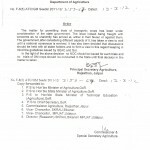 So far, international seed majors Monsanto, Dow Agro Sciences and Pioneer have applied for and got permission from the Genetic Engineering Appraisal Committee (GEAC) under the centre to conduct trials of Ht/Bt Corn in Rajasthan this year, but this was subject to a mandatory no-objection certificate from the state government. With the state’s recent decision not to permit GM trials for now, the trials planned by these companies in the coming season hangs fire. The order, for the first time, sends a strong signal that Rajasthan is not up to indiscriminately permitting trials of transgenic crops having questionable environmental consequences, without an informed debate. So far, Chattisgarh, Madhya Pradesh, Bihar, West Bengal, Kerala, Odisha and Karnataka have said an outright ‘ no’ to GM crop trials in their respective states, while Tamil Nadu, Uttar Pradesh, Punjab and Maharashtra have not yet issued NoCs. 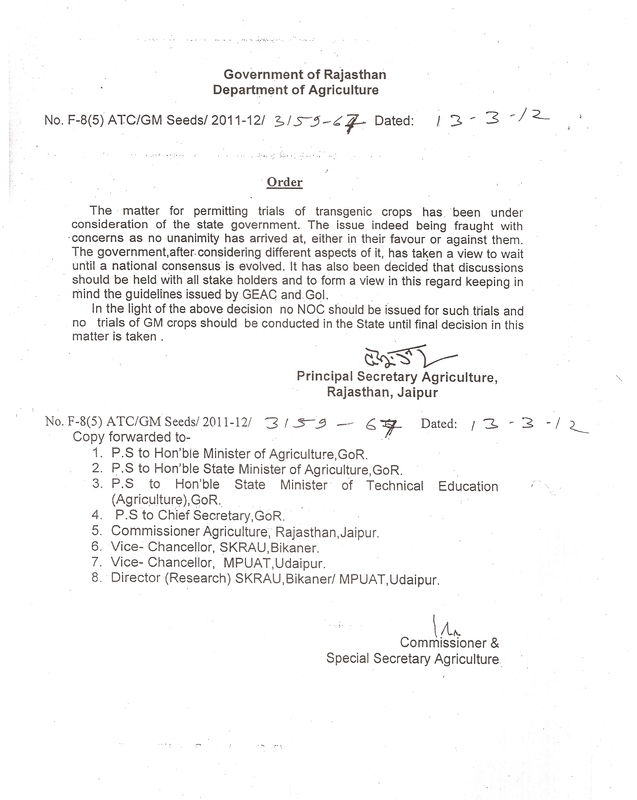 Earlier, GM crop experiments were approved directly by the GEAC under the central govenrment. However, state NoCs became mandatory since July 2011 after Nitish Kumar objected to GM trials taking in Bihar without the state government’s consent, as agriculture is a state subject.